This publication describes a relatively small excavation (by CAM ARC, now Oxford Archaeology East), whose size belies its significance. 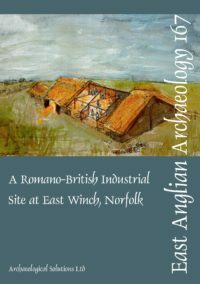 Incredibly, this is the first properly documented archaeological excavation in the core of Wisbech — an historic town long suspected to have preserved interesting medieval deposits. 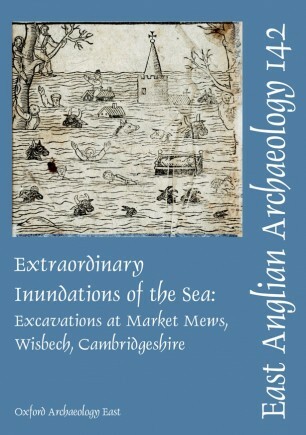 It fills a gaping void in previous knowledge of the character and quality of the archaeological remains in the town and represents an important first step in redressing the regional imbalance in published medieval port sequences, such as those of King’s Lynn and Great Yarmouth. The site lies within the confines of the New Market, to the north of the Norman castle. An impressive sequence of deeply stratified medieval to early post-medieval deposits was revealed, demonstrating at least thirteen building phases, the earliest of which dates to the 13th century. One structure contained evidence for in-situ metalworking during the mid 14th to mid 15th century. The buildings were each sealed by fine silts deposited during episodic flooding which can be broadly linked to documented climatic conditions of the period. Detailed recording was achieved through micromorphological analysis and the use of high resolution thin sections. While the alternate sequence of occupation and flooding found at Wisbech is broadly comparable to deposits in other regional port towns, it is almost without parallel in terms of its completeness, depth and state of preservation. A wealth of organic remains and subtle features are present, which rarely survive elsewhere in East Anglia. The discovery of this important archaeological resource highlights the requirement for consideration of its future management.